* Al Clauser and his Oklahoma Outlaws' collection of original mountain and range songs. Folio no.1. Portland, OR: American Music Inc., 1937. 49 p. 18 songs. * Al Clauser and his Oklahoma Outlaws' collection of original songs of the West. No.2. Portland, OR: American Music Inc., 1939. 49 p.
* Al Clauser and his Oklahoma Outlaws' folio of original songs. Folio no.3. Portland, OR: American Music Inc., 1941. 46 p. 20 songs. * Albert E. Brumley's songs of the pioneers: a collection of songs and ballads of the romantic past. Camdenton, MO: Albert E. Brumley and Songs, 1970. [64 p.] 60 songs. See: Gene Gideon "Folk music history in song" p.32-33. * Al Trace original songs, cowboy songs, mountain ballads. Chicago: M. M. Cole Publishing, . 63 p. Ill. 55 songs. Alberta Slim's circus and cowboy song. Folio no.3. [Toronto]: Empire, 1951. Alberta Slim's songs of the Bar-X Ranch. Folio no.2. [Toronto]: Empire, 1950. Alberta Slim's western songs. No.1. Toronto: Gordon V. Thompson, 1947. * Alka-Seltzer song book. Elkhart, IN: Miles Laboratories, 1937. 15 p. 27 songs. * All join in pioneer community song sheet: 75 favorites you love to sing. New rev. ed. New York: Paull-Pioneer Music Corp., 193- See: "Long, long trail," "Home on the range," "Comrades." 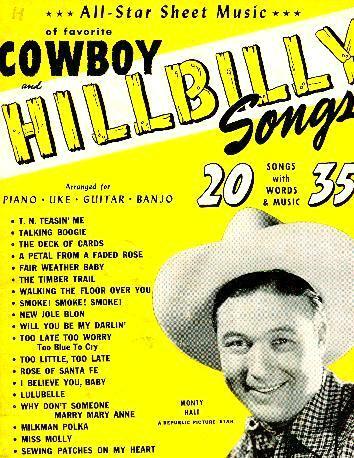 * All-star sheet music of favorite cowboy and hillbilly songs. New York: Words to Songs, 1949.
v.1, n.2, 1949. 32 p. 20 songs. * Allan, Fleming. Behind those swinging doors (The doors swing in - the doors swing out). Hollywood, CA. : American Music Inc.; Toronto: Canadian Music Sales, 1937. 3 p.
"Words and music by Fleming Allan." "Recorded by Spike Jones and his City Slickers." On cover: Allen Erwin, "The Calgary Kid." Ed. by Hugo Frey. 70 songs. 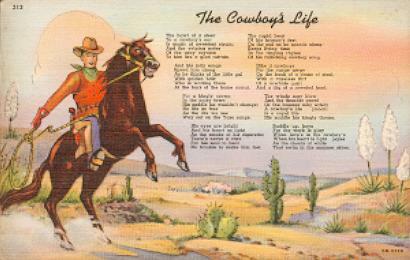 American cowboy songs. New revised edition. New York: The Big 3 Music Corporation, [1971?]. 96 p.
* American war songs. Published under the supervision of National Committee of the National Society of the Colonial Dames of America. Philadelphia: National Committee of the National Society of the Colonial Dames of America, 1925. Reprint. Detroit: Gale Research, 1974. 202 p. See: Chapter 3 "Mexican War" p.54-65. * Amsterdam, Morey. Oh why, oh why, did I ever leave Wyoming. New York: Leo Feist, 1946. 2 p. Featured by Jerry Colonna. * Archer, Harry; Thompson, Harlan. I love you: Je t'aime! Toronto: Leo Feist, 1923. 5 p. Sensational Fox Trot from the New York Success "Little Jessie James: a musical farce". Chanson avec paroles francaises. Book and lyrics by Harlan Thompson; music by Harry Archer; staged by Walter Brooks; French words by Paul Combis. Arizona Red's collection of cowboy songs. New York: Amsco Music, 1938. See: "Round-up day in Arizona," "Buffalo skinners," "Little old sod shanty." * Archer, Harry; Thompson, Harlan. I love you: Little Jessie James. Toronto: Leo Feist, 1923. 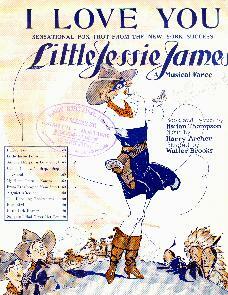 5 p.
Sensational fox trot from the New York success "Little Jessie James: a musical farce". Book and lyrics by Harlan Thompson; music by Harry Archer; staged by Walter Brooks. 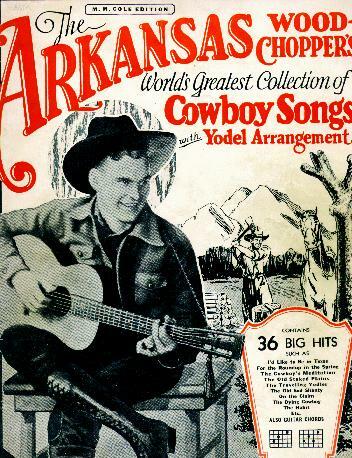 * The Arkansas Woodchopper's world's greatest collection of cowboy songs with yodel arrangements. Chicago: M. M. Cole Publishing, 1931. 66 p. 34 songs. * The Arkansas Woodchopper's world's greatest collection of cowboy songs with yodel arrangements. Chicago: M. M. Cole Publishing, 1931. 66 p. 35 songs with 2 not in other 1931 edition. On cover: "Contains 36 big hits," but 37 included. Art Dickson's original songs. Hollywood, CA: Cross Music Company, c1943. * Arthur Smith's original folk songs. Folio no. 1. With foreword by Alton Delmore. Hollywood, CA: American Music Co., 1943. 46 p. 20 songs. * Asher Sizemore and Little Jimmie's 1936 edition fireside treasures: mountain ballads, old hymns, children's songs, cowboy songs. Louisville, KY: Asher Sizemore, 1935. 47 p. 52 songs. 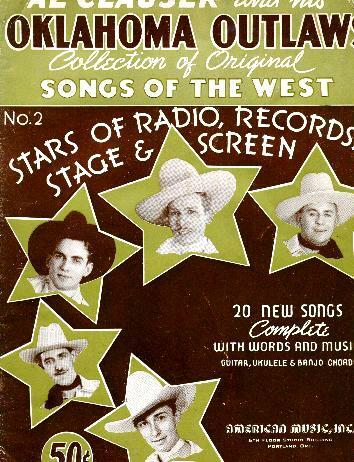 Includes four song insert, 1935: Horse and buggy days; When we kneel with our savior in prayer; From Jerusalem to Jericho; Will you be the same old sweetheart. * Asher Sizemore and Little Jimmie's family circle songs: 1938 edition. Laurel, Ind. : Asher and Little Jimmie, 1937. 48 p. 50 songs. Backcover: Rayner, Dalheim and Co., Chicago. * Asher Sizemore and Little Jimmie's family circle songs: 1938 edition. Laurel, Ind. : Asher and Little Jimmie, 1937. 48pp. 50 songs. Variant: different photographs p.2-4. * Asher Sizemore and Little Jimmie's favorite songs: mountain ballads, old hymns, children's songs, popular songs. Louisville, KY: Asher Sizemore, 1934. 32 p. Ill. 20 songs. See: "Little Cowboy Jim" p.6. 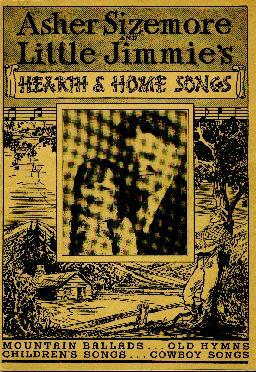 * Asher Sizemore and Little Jimmie's hearth and home songs: mountain ballads, old hymns, children's songs, cowboy songs - 1935 edition. Louisville, KY: Asher Sizemore, 1934. 48 p.
* Asher Sizemore and Little Jimmie's songs of the soil: mountain ballads, old hymns, children's songs, cowboy songs - 1937 edition. Laurel, Ind. : Asher and Little Jimmie, 1936. 48 p.
* Asher Sizemore and Little Jimmie's songs of the Southland: mountain ballads, old hymns, children's songs, cowboy songs. 1947 Edition. Rushville, IN: Asher and Little Jimmie, 1947. 48 p. 50 songs. At home on the range with Levi's: your favorite songs. Thermopolis, WY: Wright's Clothing Store, [c1950]. Illustrated by Lee M. Rice. 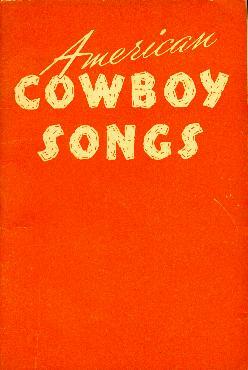 Five cowboy songs from "The Cowboy Sings," published by Paull-Pioneer Music Corp. in 1932 and edited by Kenneth S. Clark. * Atcher, Bob. Answer to you are my sunshine. New York: Southern Music, 1941. 3 p. Cover: Bradley Kincaid. * Autry, Gene. You're the only star (in my blue heaven). New York: Shapiro, Bernstein and Co., 1938. 5 p.
* Autry, Gene; Rose, Fred. You'll be sorry. Hollywood, CA: West'rn Music Publishing, 1942. 2 p. Cover: Featured by "Tiny Hill," America's biggest band leader. Avril, Charles. The girl I loved out in the golden West. Poem by C.H. Scoggins, music by Charles Avril. Denver: Tolbert R. Ingram Music Co., . "Whereof the shining goal was comradeship."